Do secrecy agreements hold with the Royal Commission? Many victims who endured sexual abuse at the hands of criminals from institutions involved in the Royal Commission are unsure about the ramifications of secrecy or confidentiality agreements they have previously signed. In an attempt to silence victims in the aftermath of traumatic sexual abuse, various institutions sought to include secrecy agreements and confidentiality clauses when settling cases. It was clearly in the institutions best interests to prevent any details of the abhorrent abuse suffered from entering the public arena. With the announcement of the Royal Commission into Institutional Child Sexual Abuse, many victims were left confused about their rights to provide evidence because of these secrecy agreement. If you are worried about your responsibilities, you can rest assured. This should not hold you back from giving evidence. You are legally allowed to talk to a solicitor and the Royal Commission about abuse you have experienced, even if you have signed a confidentiality agreement or deed of release in the past. The Commission’s far reaching powers override any requirement in these legal documents that you must say nothing about the abuse or any related payout you received. Peter and the Kelso’s team have represented people who have been pushed into signing secrecy documents. Often victims do not properly understand the documents as no representative from the institution involved explained the significant ramifications. One Kelso’s client suffered abuse that denied him an education. He was forced to sign a deed of release that he couldn’t read. In addition, you have the opportunity to fight for a more just compensation for the abuse you’ve suffered, even if you have been compensated in some way already. It is highly unlikely that one of these secrecy agreements will stop the Kelso’s team from achieving more compensation for you. Peter and the team will look at anything you’ve signed very closely and we can have a detailed chat about any concerns you may have. The commission expects that all institutions that may have entered into confidential agreements with individuals will cooperate with the commission in relation to the disclosure of those matters. If you have previously settled a claim against the state on terms that include obligations of confidentiality, you can still tell your story to the Royal Commission. The state will waive its reliance on any such obligations for the purpose of the Royal Commission. 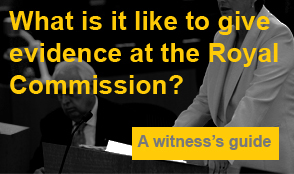 If you’re debating whether or not to give evidence at the Royal Commission, please, tell us your story. We’ll help you understand what to expect so that you can make a more informed decision. The Commission is gaining momentum and calling for victims and witnesses to come forward. You can be a part of the fight for justice to make sure this can never ever happen again.